Just about any Brisbane pub you swagger into will have a few whiskies on the shelf, but there are only a handful of ridgy didge whisky bars in our balmy city. True connoisseurs of the dark golden liquid are as passionate and knowledgeable about it as wine lovers are about fermented grape juice. Whether you are one of these obsessives, a hobbyist, or just a casual drinker, there is no doubt a lot of enjoyment to be had from sitting down in an atmospheric locale where there are a huge amount of whisky options available and old hands to help guide you through them. And if you're a whisky ignoramus? Even better. You have much to learn and a great deal of whisky to sample, and Brisbane's best bars are eager to educate you. 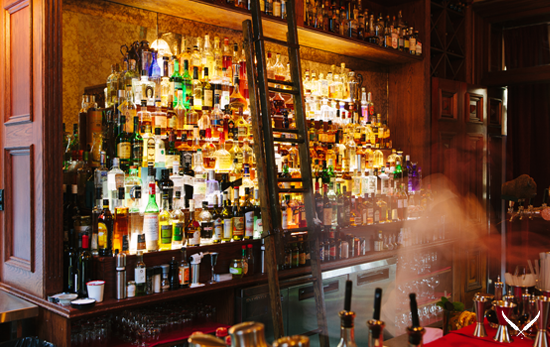 Here are six of Brisbane's finest whisky bars. These hepcats take their whisky seriously. One of the few Brisbane joints that focuses almost exclusively on the famous tipple, Cobber boasts Scottish, Irish, Japanese, Australian and Canadian varietals, and the experts who tilt the bottles for you can talk endlessly about their product. They have also created an unembellished but warm atmosphere that is perfect for sipping on that deep dark elixir of the gods. When it comes to Brisbane drinking establishments, Lefty's has basically gone viral. If it were a YouTube video it would be Gangnam Style or Charlie Bit My Finger—it's undoubtedly one of the best bars in Brisbane for having a rootin' tootin' good time in and has well earned its reputation. Amid all the hype surrounding the city's best good-time saloon, however, it is worth remembering that they actually do alcohol very well. Especially whisky. In keeping with the theme of the place, there is a veritable smorgasbord of bourbons and other American whiskies rising all the way to the ceiling behind the two downstairs bars. Even though they only started producing commercially in 2008, Nant has fast developed a reputation as a genuinely world-class Single Malt whisky. Hailing from the Central Highlands of Tasmania, this distiller has four bars in Australia… and two of them are in Brisbane! The city edition is a bit more of a social affair compared to the smaller one in The Valley, which might be better suited to those who want to remained focussed on tasting and not be distracted by good-looking people. Whichever Nant you end up, you're sure to leave satisfied if you're a whisky lover. Brisbane's answer to the kind of classic American whisky bar you see in movies, you won't find better than the super-suave Gresham when it comes to ambiance. The staff at this Brisbane bar really know their business as well, so have a word to them if you're looking for recommendations, or just if you like to talk whiskies. Located in the historic Wenley House on Market Street, Malt's vintage feel makes it a charming place to imbibe some barrel-aged liquor like you mean it. Sip on some Islay Bowmore 18 year, some Lark from Tasmania or a bit of Yamazaki from Japan; Malt's elegant oak bar has these tipples and many, many more for you to enjoy. Featuring over 200 whiskies, including selections from every one of Australia's 18 distilleries, you won't be left wanting for variety at the Naked Whisky Bar. Some of the special treats behind the bar include the Buffalo Trace Antique Collection of five limited-release editions and a collection of Van Winkle's hard-to-find soft wheated malt bourbons. Click here for more of Brisbane best bars!